The Easter rally organised by United Christian Welfare Society of Sikkim to mark the Easter Sunday passing through the streets of Gangtok on April 1, 2018. Photo: Sagar Chhetri. Members of different churches in and around Gangtok joined the Easter Prayer Rally organised by the United Christian Welfare Society of Sikkim to mark the Easter Sunday. The Easter Prayer Rally commenced from Convey Ground in Tadong and walked along the National Highway with Easter songs. The members were carrying placards and banners with the messages of the resurrection of Lord Jesus. The rally finally concluded at Bethlehem Church in Development Area with prayers. 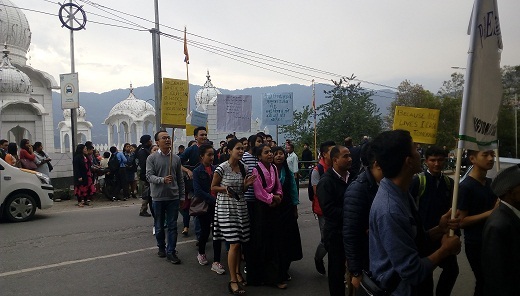 UCWSS president, Elder Patrus Gurung told Northeast Now that around 3000 members including elderly persons and young children from different churches of Gangtok participated in the Easter Prayer Rally. “The rally was also an occasion for members of different churches to celebrate the Easter Sunday together and we also prayed together for the well-being of the people of Sikkim, the nation and the world,” he said.